Mark D. Weinstein (pictured) has accepted the position of Dean of Enrollment and Marketing at Grace College, Winona Lake, Indiana, effective April 1. Weinstein is a 1982 Grace College alumnus and also holds his M.S. degree in organizational leadership from Geneva College. In his new position at Grace, Mark will lead undergraduate and graduate enrollment and marketing. Weinstein comes to Grace from his position as Director of Marketing and Public Relations at Maryville University in St. Louis, Missouri. Prior to that, he was Director of Public Relations and Enrollment Marketing at Robert Morris University in Pittsburgh, Pennsylvania, from 1999-2005, and Director of Marketing and Public Relations at Geneva College in Beaver Falls, Pennsylvania, from 1990-1999. Mark and his wife, Lisa, plan to relocate to the Winona Lake area later this spring. 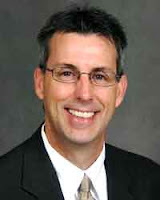 He will be replacing Ken Moyer, who left the enrollment post in late December.